Almost every home buyer we talk to wants to know something about real estate values by school zone. 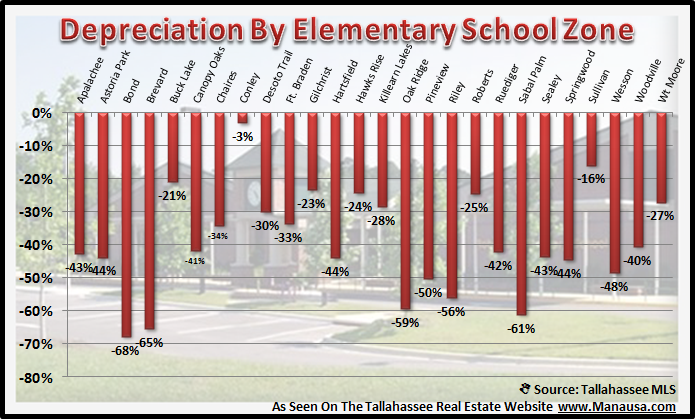 Even people who do not have children that are school aged seem to think it is important to understand "where the best schools are," so I have compiled a quick overview of real estate values by school zone in Tallahassee. The first thing that I will tell you is that this is no way to measure the quality of any particular school. The Leon County School Board has wonderful information for you to review in order to find the school that you think might be best for your child's particular needs. This report of real estate values by school zone is really more beneficial for the "after school selection" process, knowing the specific nature of the housing market in that area. Our first real estate graph shows that all high schools saw the real estate market rise to a peak in 2006, and then begin the decline in 2007. Not all schools have fared the same however. We can see that Chiles High School, Lincoln High School, and Leon High School have done far better recently than have Godby High School and Rickards High School. When we compare current home values to home values found at the peak of the market, the differences are even more apparent. 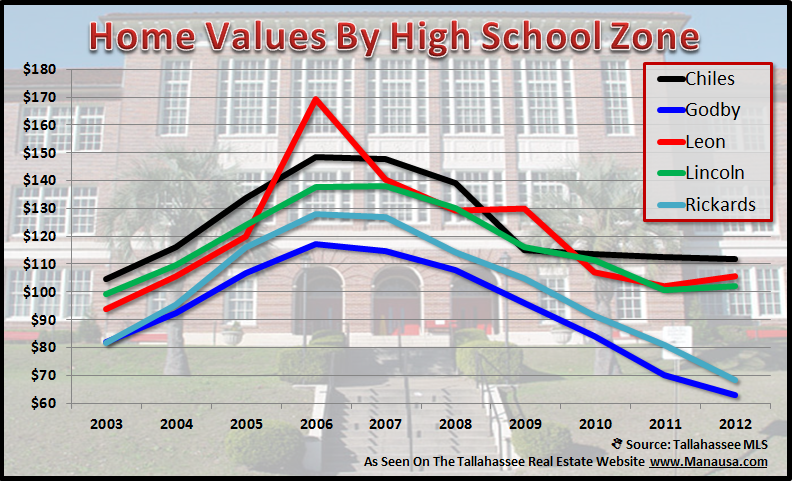 Each Tallahassee High School has two columns in the real estate graph below. The left column shows real estate depreciation since the peak of the market, while the right column shows the average home value change since 2003. For example, average home values in the Leon High School zone have dropped 38% since the peak of the housing market, but are still 12% higher than their corresponding home values in 2003. 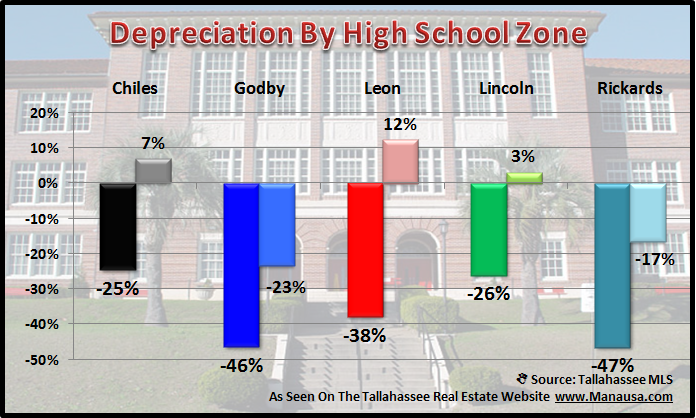 We can contrast that with average home values in the Godby High School zone. Home values have dropped 46% since the peak of the housing market, and they are down 23% below home values in 2003. 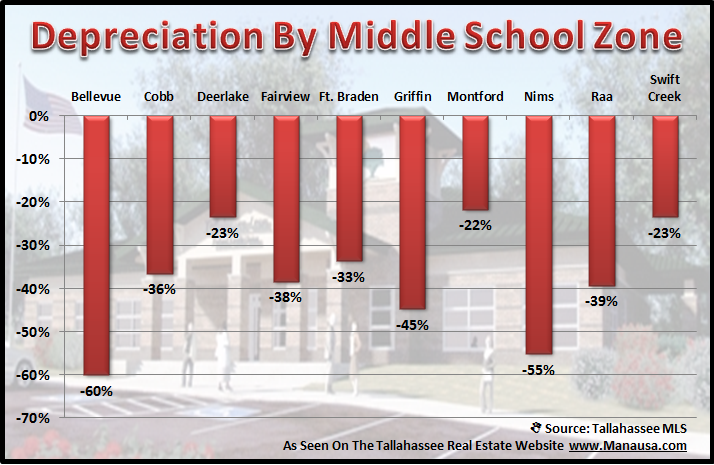 This next graph shows real estate values by middle school zone in Tallahassee, specifically how much value has changed since the peak of the market in each school zone. Home values have fallen as little as 22% for those zoned for Montford, and as much as 60% for those zoned for Bellevue. Finally, real estate values by school zone for elementary schools in Tallahassee. Conley Elementary is no new that it's results are skewed, but values for homes zoned for Kate Sullivan Elementary are down only 16% since the peak of the housing market. The other end of the spectrum are homes zoned for Bond Elementary School, which have depreciated 68% since the housing market peak. Thank you for visiting the Tallahassee Real Estate Website. If you want more information specific to school zones in Tallahassee, and specifically how they relate to home values, just drop me a note and we can schedule a time to review your concerns. 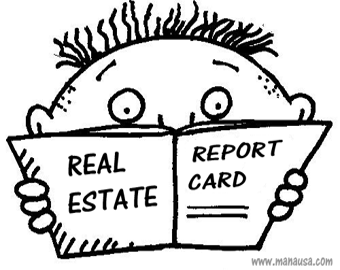 You can always check back here for updated reports on real estate values by school zone in the future.